I tested these out during before IMATS Toronto 2010 and pick the 0-(Zero Minus) and 2(Ivory) during the 2010 show. They retail for $45.00 each for 1 oz/30 ml or $32.00 0.68 oz/20 ml for the PRO size of product. Samples are $1 from their site. At IMATS they are about 30% off. 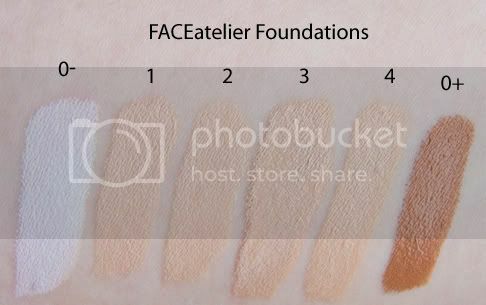 Daylight Swatch: FACEatelier Ultra Foundation 0- Zero Minus, #1 Porcelain, #2 Ivory, #3 Wheat, #4 Sand, and Zero Plus. Product: This is a buildable liquid foundation for coverage but being a liquid also means you won't get the doll mask opacity that I like in my foundation when you apply it. The swatches above are thick for colour reference. It does cover imperfections and mimic skin texture as this is a silicone based foundation. The feel is heavy but no uncomfortable one the skin (no pulling as it dries). 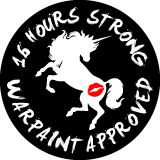 You don't need a primer for longevity as I've worn this without one just fine. For me, min mix was 2 parts 0- with 3 part #2 to get a shade closer to my skin. It doesn't take out all the redness in my face but I'm left with something much cleaner looking palette to build off from. The natural dewiness is a bonus because you just look so healthy but no one knows what's different. Colour: This line was designed for mixing and odd shades are cool (pink) tone while the even numbers are warm (yellow) tone. Wear: A full 18 hours with minimal fading I've seen during the summer. Packaging: 1 oz/30 ml comes in a glass pump bottle or 0.68 oz/20 ml in a plastic pump bottle. I found the pump was easy to measure. Compare: MAC prolonger wear foundation is similar in price and product but I like the finish of these more. I do love this foundation but for me correcting the redness in my face is not something other then full coverage foundation can do so I haven't bought a second on of this in that pursuit. But because it mimics skin and a natural dewy finish without the need for other products and can set on it own without powder with its built-in primer for those that have dry, normal and come skin should be checking this out.